There are numerous reasons to love Paris- one being its exquisite architecture. There are so many beautiful buildings in Paris, inside and out, but there is one that rises to the top in my mind. 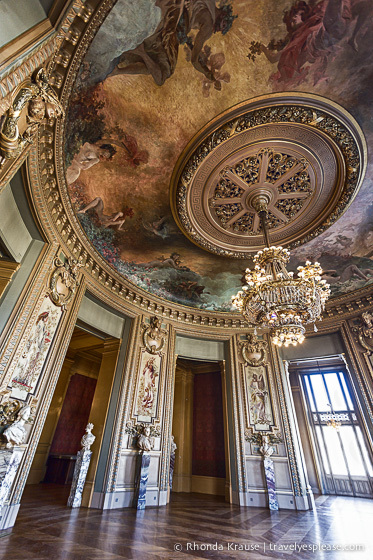 The Palais Garnier is a dazzling building, frequently called an architectural masterpiece. The gilded, extravagant interior will make you feel as if you are in the richest of royal palaces, rather than an opera house. If you’re in Paris for a few days, I’d recommend finding some time to visit Palais Garnier. You can tour the building during the day or attend a performance in the evening. We weren’t able to attend a show, but did do a self-guided tour of Palais Garnier during the day. Here are some photos from our visit and the story behind one of Paris’ most elegant buildings. The idea to build a new opera house was part of Napoleon III’s grand urban renewal plan for Paris. In 1860, a competition was held to choose the architect who would build the new opera house. Out of 171 proposals, it was the design of a 35-year-old unknown, and relatively inexperienced, architect that was unanimously chosen to become Paris’ new opera house. In 1861, architect Charles Garnier began construction on the prestigious building for the Paris Opera. Garnier hired France’s finest craftsmen, sculptors and painters to bring to life his exuberant design. The opera house was bold and opulent, fit for a king (or in this case, an emperor). Garnier made sure to include a protected entrance on the side of the building to shield Napoleon III from assassination attempts. Even the avenue leading to Palais Garnier was redesigned with the Emperor in mind. The Avenue de l’Opera was built so that the Emperor and Empress could quickly travel directly from their residence in the Tuileries Palace to the new theatre. Unfortunately, Napoleon III would never get to enjoy the opera house. His declaration of war on Prussia in 1870 briefly halted construction and led to his eventual exile in England, where he died in 1873. Construction of Palais Garnier continued under the newly proclaimed Third Republic. However, Garnier was asked to remove all imperial emblems before the New Government of National Defence requisitioned the building. When Palais Garnier was finally finished in 1875, it was enthusiastically praised. The opera house was even hailed as one of the most grandiose Italian-style theatres in the world. At the time of its completion, the theatre boasted 2,156 seats and the world’s biggest stage. On January 5, 1875 Garnier’s masterpiece was inaugurated by Marshal Mac-Mahon, the President of the Republic. Although the Garnier is no longer Paris’ main opera house (Opera Bastille has assumed that role) it still is a popular venue for performances of opera and dance. While I thought every aspect of Palais Garnier was exquisite, there are two areas which really impressed- the Grand Staircase and the Grand Foyer. Charles Garnier said it best when he proclaimed, “The opera is the staircase”. Upon entering Palais Garnier, the Grand Staircase will immediately command your attention. Built of white marble from Seravezza, Italy, the staircase is as luxurious as the material used to build it. The onyx balustrade is built on a base of green marble from Sweden and all 128 balusters were crafted out of antique red marble. The Grand Staircase is flanked by 30 large columns, each one made out of a single piece of marble. Let your eye follow the columns up to the ceiling and you will be met with a marvelous fresco painted by Isidore Pils. The Grand Foyer was a place where people could stroll and chat before performances, no doubt in admiration of the gold that decorates nearly the entire room! In the centre of all the gold and glitter, is an impressive ceiling fresco painted by Paul Baudry, who was summoned from Rome by Garnier. The central painting is an allegory of Music. On each side are smaller paintings in oval frames, one representing Comedy, the other Tragedy. As a lover of palaces and architecture, Palais Garnier had me smiling from ear to ear, that is when my mouth wasn’t hanging open in astonishment! If Palais Garnier isn’t on your list of places to see in Paris, it really should be. I thought it was the most beautiful building we visited during our 4 days in Paris. Palais Garnier is on the corner of Rue Scribe & Rue Auber. To reach by metro, take lines 3, 7, or 8 and get off at the Opera station. Guided tours are 90 minutes and cost €15.50 for adults and €11 for under age 25. Children under 10 are €8.50. English tours are on Wednesdays, Saturdays and Sundays at 11:30 am and 2:30 pm. In July and August, English tours run every day at 11:30 am and 2:30 pm. You can buy tickets inside Palais Garnier at the ticket desks. The desks are open every day from 10:00 am- 4:30 pm with extended hours until 5:30pm from mid-July to September. Visiting hours are 10:00 am- 5:00 pm (6:00 pm in July and August), with the last admission at 4:30 pm (5:30 pm in the summer). Admission to the auditorium may be restricted or forbidden at times for technical or artistic reasons. For your convenience, here is a list of hotels near the Garnier Opera. Please consider booking your Paris accommodations through the included link. It costs nothing extra and helps support this website. Thank you! Information was correct at the time of publishing but can change without notice. Please confirm directly with service providers. Purchases made through the included links earn us a small commission, at no extra cost to you, and help support this website. Thank you!